In the usual installation, the Interlock is mounted on the door and the bolt eye is mounted on the doorframe or jam. For some applications this can be reversed. When the Interlock is mounted this way, and the key of the Interlock is removed, the door is positively locked closed. The most commonly used B-857 compartment door Interlock is the End Mounted type. This unit with our Bolt Eye Chain adapts to many industrial applications including those where poor alignment of door and frame exist. Flush and Sub mounting options are available. Please contact our factory for details or application recommendations. 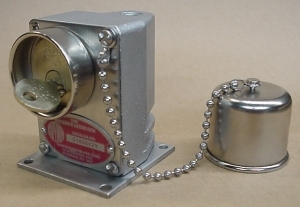 The Superior type B-857 access interlock is available in our standard alloy die-cast or with the lock cylinder totally protected by 300 series Stainless Steel for harsh and high temperature applications such as precipitators, baghouses, scrubbers, petrol-chemical facilities, food process and packaging facilities, robotic welding and assembly, etc. Please see our cut sheet for specifications or contact our factory for details or recommendations. Shown above, is the Superior Stainless Steel, Type B-857, end mounting door interlock. 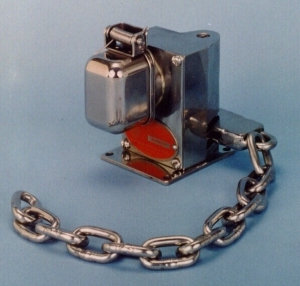 The stainless steel interlock has a chain type bolt eye; plated lock cylinder with a stainless steel dust cover (weldable mounting plate available). The door lock is for use in harsh environments found in electrostatic precipitators and chemical plants.